To control and manage the content being displayed on your site, you should pay attention to the five following options: Filter bad words, Login to view content, Pending questions, Pending answers and Email notification for following questions. 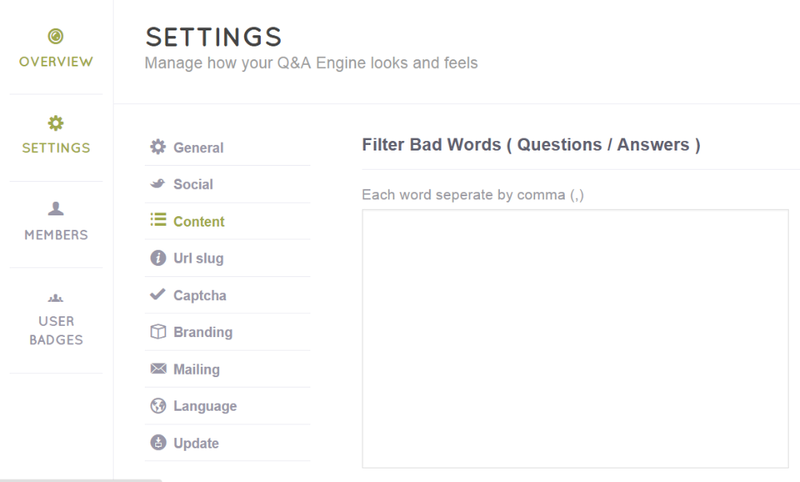 Sometimes, there are few users using inappropriate words in their questions or answer, so you can prevent these words from appearing on your website by this option. Listing words you suppose that they are not appropriate, remember that each word separated by comma, and these ones will automatically turn into *** on your front-end. Enable this function if you want to restrict the number of people who can see the content. This will only allow the login users to approach the website’s content. You can prevent inappropriate questions from appearing on your site by enabling this function. After that, a question has to receive your approval before being displayed in the front-end, which means you can absolutely keep your site stay away from unsuitable ones. 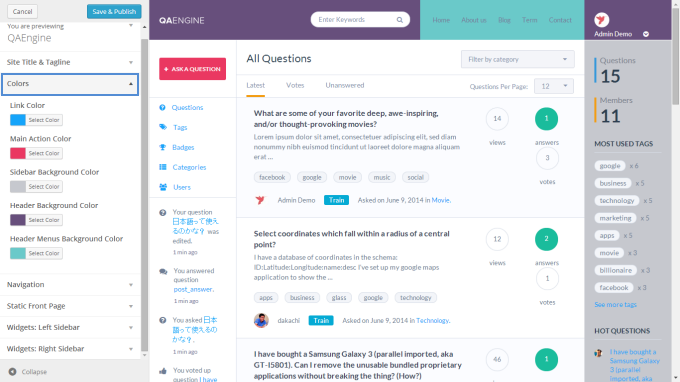 - In front-end: Choose tab Pending -> tick Approve for questions you want to publish. This function is similar to Pending questions, but this one applies to answers. The option allows the system automatically send an e-mail to the users whenever there is a new answer for the question they are following. To start your customization, choose Appearance > Customize. Simply insert the content and you can quickly change your Site title and Tagline. The site’s link color: choose the color for the text that can link to a page. The main action color: choose the color for the text present the main actions. Ex: Ask question. The sidebar background color: choose the color for the sidebar background section. The header background color: choose the color for the header background section. The header menus background color: choose the color for the header menu background section. The site’s link color: blue. The sidebar background color: gray. The header background color: violet. The header menus background color: light blue. And this is how it will appear in the preview. In this section, you can decide which menus to be displayed in the front-end. Currently, QAEngine supports 2 menus: on header and on Left sidebar. According to your preference, click on the dropdown list to select which menu will be the header, which menu will be the left sidebar. Ex: As you can see in the picture, we chose “Header menu” to be displayed on header and “Left menu” to be displayed on left sidebar. This section allows you to choose a page to appear as your front page and posts page. Your latest posts: if you choose this option, the latest posts will appear in your front page. Click “Add a widget” then choose the widget you want to appear. You can also use search bar to quickly find the widget. After adding a widget, insert all the needed information. 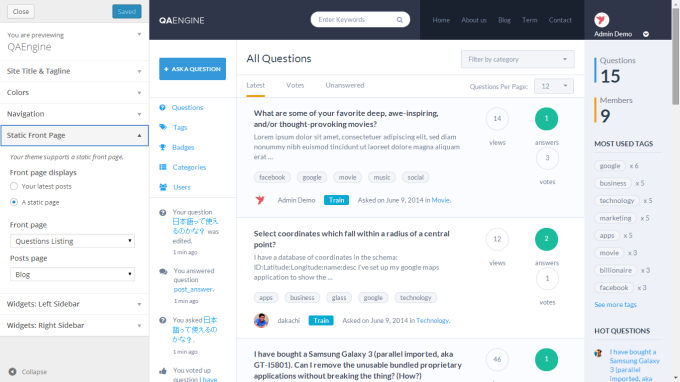 As you can see, we added QA Latest Questions. You can also delete a widget if you don’t want it appear anymore. Reorder: you can use this function to arrange the order of the widgets.